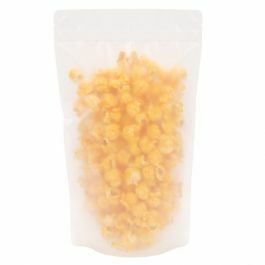 Add a touch of elegance to your bulk packaging with this 2 lb zipper top frosted stand up pouch. ZBGF6 measures 9" x 4 3/4" x 13 1/2" and holds 2 lb/907 gr of bulk coffee beans, dried fruit, grains, powders, pet food, and more. This 5.5 mil bag is constructed with a high barrier and has a smooth, semi-transparent finish. 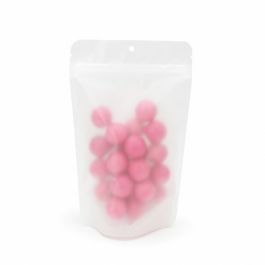 Our durable matte frosted stand up pouches allow you to package bulk items with sophisticated style. The ZBGF6 zipper top pouch measures 9" x 4 3/4" x 13 1/2" and has a usable space of 8 1/2" x 4" x 11 3/4". The pouch is ideal for holding 2 lb/ 907 gr of dry goods and specialty food products. Package popcorn, chips, pretzels, detergent pods, pet food, and more. This 5.5 mil bag provides heavy-duty protection and is constructed with a high barrier to protect against moisture, odor, and oxygen. 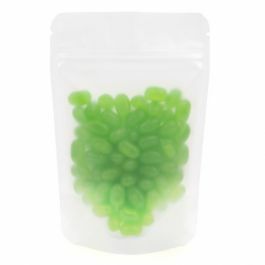 A strong, resealable zipper and laminated interior seal in freshness, flavors, and aromas. This pouch is heat sealable for a tamper-resistant closure. Semi-transparent panels offer a smooth finish and provide ample space for product branding and labeling. Custom printing is available. Outer Dimensions: 9" x 4 3/4" x 13 1/2"
Inner Dimensions: 8 1/2" x 4" x 11 3/4"
Measurements listed by outer dimensions (WxDxL).